Making sure players, spectators and visitors have comfortable, available and safe seating is always a concern. At SightlinesBleachers.com, we take the worries off your shoulders. 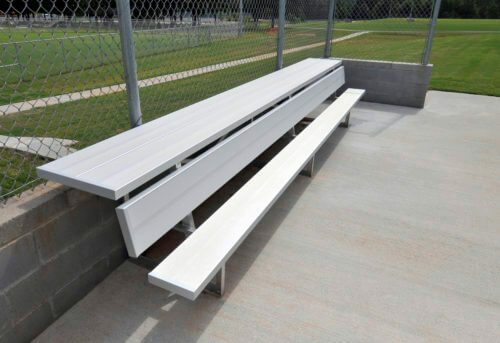 Our product line is designed not only to deliver the best in aluminum bleachers, but also aluminum benches meant to suit a wide variety of needs. At SightlinesBleachers.com, we deliver more than 30 years experience to our customers. We are able to assist with small installations and large-scale operations alike. Our commitment to offering the best and safest products has made us an industry leader. From our headquarters in Kentucky, we serve clients all over the country and beyond with the best in service, competitive pricing and exceptional products. When you purchase aluminum bleachers, aluminum picnic tables and other products from us, you can count on performance. 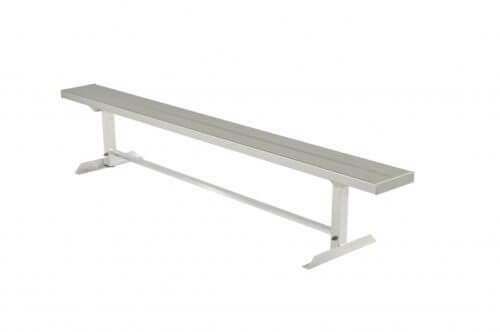 Player benches with backrests – We offer a wide selection of aluminum benches meant to give players a place to sit in comfort. Our backrests provide the support players need when they come off the field or court. Our designs range from those with a seating capacity of about five people up to 18. 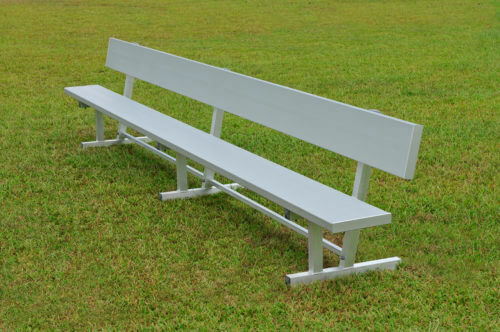 Player benches without backrests – If you just need standard aluminum benches for your players, we’ve got the inventory items you’re after. Our selection includes a wide range of seating capacities, including models that can hold up to 18 players. 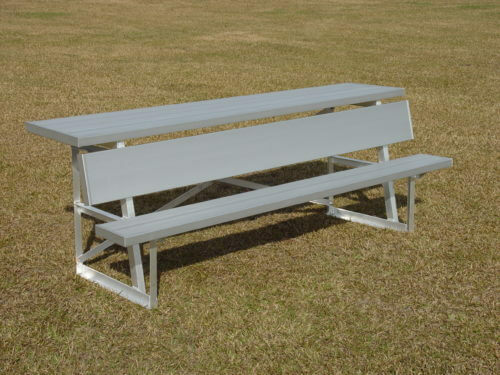 Benches with shelving – When there’s a need to be able to store gear along with players, we have the designs you require. Our player benches with shelves also deliver back support, as well. Models in this line of aluminum benches include designs that can seat up to 18 players comfortably while holding some gear. 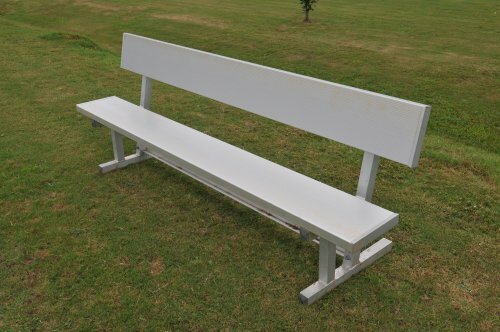 Double team benches – These benches provide the seating comfort players need after a hard outing in a game. Within this category, we offer seating options for up to 18 players on a single bench. You’ll also find that we make both portable designs and in-ground mounts. At AluminumBenchesDirect.com, we’re in business to help make your special events or game days better. From our aluminum picnic tables to our outdoor bleachers and beyond, every product in our line is built for maximum comfort, safety, and durability. Our aluminum bleachers and other designs even meet IBC Codes, so you can count on the safety of our products. If you’re in the market for aluminum benches, we invite you to explore our inventory. Don’t forget to check out our other categories to meet all of your special events needs. 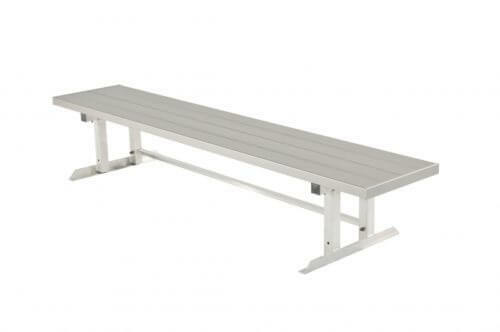 Our aluminum bleachers are an excellent selection for large sporting complexes, schools and more. To order any of our aluminum benches, just shop online to select the design that best suits your needs. Once you find the product that you require, just order directly from our website. If you have any questions, don’t hesitate to contact us directly at 1-800-609-1545. We’re here to make your shopping experience a great one.